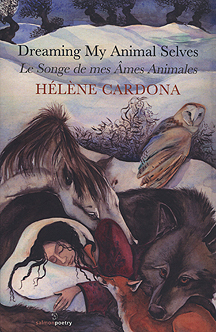 Dreaming My Animal Selves / Le Songe de mes Âmes Animales, by Hélène Cardona, Salmon Poetry, Ireland, 2013, 79 pages, $21.95 paperback. 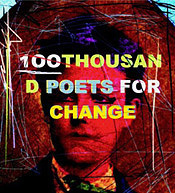 Having been astonished some years ago by Hélène Cardona's The Astonished Universe (English and French Edition), following which I read some of her latest poems in THRUSH Poetry Journal, I eagerly awaited the release of this new book. It did not disappoint. There is a reason the first word of the title is "dreaming.” These lucid poems transcend the page, flow into your mind through a vessel influenced by Blake and Rilke but owned completely by Cardona and her lovely, sometimes longing, lyrical constructions, light yet threaded tightly. When I was in college, at Michigan, I took a seminar on Blake's imagery, taught by the legendary late Professor John W. Wright. I'd look out of the windows during class, and Blake’s designs led me to perceive the trees as if they had shifted their forms, the branches melded. I’d come out of the class feeling as if I just had a light hallucinogenic trip, though very safe and comfortable, produced purely by literature and the writer’s accompanying prints. I felt that my "doors of perception," as Blake put it, had been cleansed at least to some degree each week. I detail this, for to some extent, such was my experience after first reading Dreaming My Animal Selves / Le Songe de mes Âmes Animales. of the Immortals, the soul resplendent. After she announced at the beginning of the book that the poems were (interestingly) first written in her non-native English, and then translated by herself into French, for some reason I was surprised that the French translation came first en face before the English, but I discovered this to be an ingenious placement, since I was almost being forced to read at least glimpses of the French (I know very little of that language, though my Spanish helps). Doing so, your perceptions are already released from their current corridors, catalyzed by Cardona's chemistry to experience these dreamlike sensations. It should be noted that Cardona is a dream interpreter, one of her many diverse talents and occupations, and this book is truly a tapestry of enchanting dreams. But the book is more than just phosphorescent, translucent dreams and illusions, and the passages to them. It is about consciousness, too, about illumination, with animals, as per the title, frequently playing a central role. In this trance Hélène Cardona often, sometimes subtly, talks about the power of place and ancestral roots. In one poem, she returns home to an island in the heart of Paris (the Seine's île Saint-Louis, the île de la Cité?—does it matter which?—perhaps apt for the poem, a bridge connects them now). There, a deck of cards allows her to shuffle her perceptions, to look out through the other side of the world for a glimpse of the hidden. It is about the strength that grows from pursuing discovery. It is comprised of the simple, beautiful experience the reader enjoys following the engaging lyrics, “lunar standstill[s],” and their subliminal power that carry you on a voyage from the book’s beginning to its end. Finally, one of the main themes of this book simply seems to be the principle of pure joyfulness, be it the seduction of orchids, or standing with a “Shaman in Residence,” or Van Goghs being compared to Chagalls. And, with that, reading these poems is a truly joyous act. 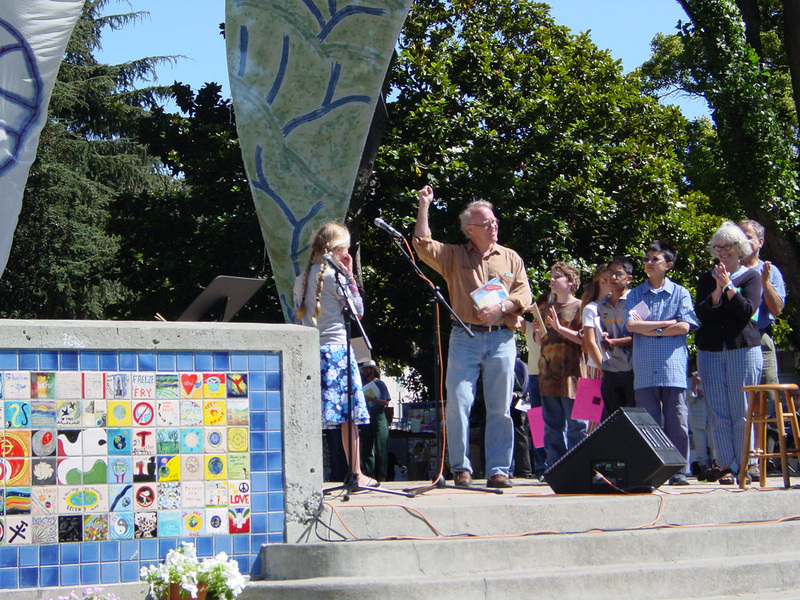 Mark Eisner heads Red Poppy, an organization focused on promoting socially conscious Latin American poetry. Through it, he’s producing a documentary on Pablo Neruda and recently co-edited the forthcoming “Poetry in Resistance: A Multilingual Latin American Anthology.” He edited and is a principal translator of The Essential Neruda: Selected Poems.